Infiniti always aspires to conquer the European continent. For this, the premium manufacturer Renault-Nissan group planned to quickly unveil two new models: a compact sedan, The Q30, and a compact crossover, The QX30. 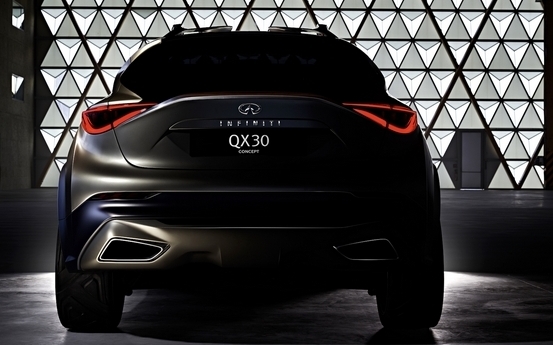 Today it is the elevated version that is talked about with a teaser supposed to give a taste of the next QX30. The image shows the rear part with a prominent tail, wide wheel arches and LED light signature that strengthens the identity of the vehicle. Its style should be closer to that of the Q30 concept, put in the mouth of the sedan unveiled at the Frankfurt Motor Show in 2013, in the meantime the production model at the next Geneva Motor Show. Technically, The Infiniti QX30 should share its platform and engines with the Mercedes A Class and GLA as part of the partnership between Infiniti and the star brand. Other teasers of this style will come out in dribs and drabs to the public presentation of the concept in Geneva in March, together with the final version of the Q30. The market for compact crossovers is expanding, and Infiniti is based largely on the future QX30 to get a place on our continent, where the brand is still confidential and remains in the shadow of German leaders of premium, Audi, BMW and Mercedes.